The Jane Austen Society of North America - Ohio North Coast AND the Ladies of Victoriana Tea Society invite you to celebrate the life of the world's favorite author with a day of fun and informative biographical programs, capped off by a visit from Jane herself! Cynthia Lundeen, Milliner, otherwise known to JASNA members as “the wonderful hat lady” will be giving a short talk about hats in Austen’s time, and she’ll have her hats at the event as well! We also will have a visit by Jane Austen herself! Debra Miller is the new director of programs for JASNA Greater Chicago Region. 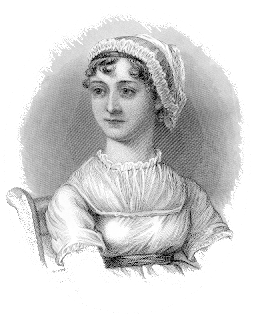 She is also an actress who performs professionally as Jane Austen. People who have seen her work rave about her dedication to authenticity and her depth of knowledge. Our own distinguished member JoAnne Podis will be talking about the way Jane Austen has been presented in the recent film Becoming Jane. JoAnne teaches film courses at Ursuline. If you have seen her speak at a JASNA meeting, you know how interesting her presentations can be. JoAnne will talk about some things the filmmakers did right and some things they did wrong as far as presenting biographical information about Austen. She’ll also share some inside information about the film. We hope to have a lively conversational Q&A! Other members and guests will also step up to the microphone. So don’t delay – order your ticket today! Also shop for dresses by The Bohemian Belle and gourmet Austen-themed teas by Bingley's Teas.